When the people we love are suffering, we must remember that the Holy Spirit gives us the power to minister to them. By faith, hope, and charity (love), we are the hands and heart of Christ to those in need. 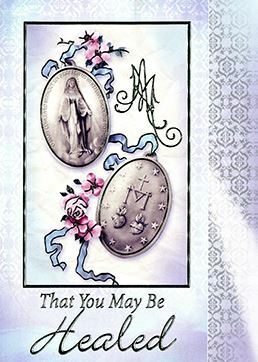 I invite you to turn in confidence to our Lady of the Miraculous Medal and send someone in need a Healing Remembrance Certificate. Whether it’s physical, emotional, or spiritual healing your loved one requires, pray for him or her, and let this card show how much you care. As long as there is need for healing, we will join you in prayer and remember your special intentions in our Masses here at our Lady’s Shrine. If you would like to burn a Votive Light at our Lady's Shrine for those who need healing, please click here. Healings continue every day through the intercession of our Lady of the Miraculous Medal. In fact, members of the Association write and call us to share stories telling how, through Mary’s intercession, Jesus has granted comfort and healing. Here’s one from a member in New Mexico whose family member was in an accident. Through Mary’s intercession, she has healed not only physically, but spiritually too. Dear Father, The most wondrous result of the prayers to our Lord and Lady is the return of Lucy’s spiritual health. Since I have known her, she has always appreciated prayers, but described herself as a ‘recovering Catholic.’ Since the accident and your prayers at the Shrine, Lucy has returned to the sacraments and is a faithful practicing Roman Catholic again. Thank you for your prayers and for placing Lucy’s name at the Shrine. Any offering you send will promote devotion to our Lady of the Miraculous Medal and support the ministries of the Vincentian community to the poor and downtrodden. You will be Mary’s hands reaching out to her abandoned children with tender care. May our Lady protect you and all your loved ones. May her intercession gain for you the answer to your prayers as you place your intentions at her Altar. And may the recipient of your Healing Remembrance Certificate grow in strength to do what is good in faith, hope, and charity. To order Healing Remembrance Certificates, call 1-573-547-2508 or 1-800-264-MARY (6279), or visit our online gift shop.